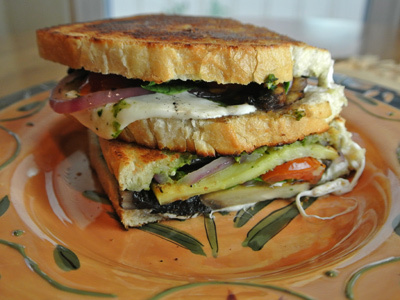 It’s been gorgeous weather this week and I decided to pick up some veggies and make panini’s for dinner. I sliced and assembled my veggies and went outside to set up the grill. It was sunny and in the upper 70’s, just perfect outside but I noticed that the wind was picking up. I drizzled my sliced veggies with olive oil and sprinkled with salt and pepper and began grilling. Everything was going well but the wind was just wicked. About the time I finished, I realized that big clouds were rolling in. I had just enough time to let the grill cool and get everything inside before it turned dark and started pouring rain. The veggies turned out perfect and I piled them together between sourdough bread with some fresh mozzarella cheese, spinach pesto and a drizzle of balsamic glaze. It was just the perfect combination!